Easy Russian Salad recipe made with peas, carrots and potatoes and mixed with a sour cream, mayo dressing that's tangy and delicious. Bring a pot of salted boiling water to a boil. Finely chop the potato and carrots into small cubes. Boil until soft then add the peas for 1 minute until cooked then drain. Run the veg under cold water until completely cold, pat dry and set aside. Finely chop the gherkins and capers together to as fine pieces as possible. Add them to a bowl with the mayo, sour cream and a pinch of salt and pepper. Mix to combine. Add the veg to the creamy dressing and mix everything together. 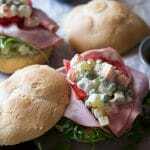 Serve as a side, on sandwiches or as an antipasto.